Son Of Sardar is an extended version of those Santa-Banta jokes, and you have to be in an idiot state of mind to enjoy it. Ashwni Dhir, who directed One Two Three (does anyone remember seeing it) and the sitcom-ish AtithiTum Kab Jaoge probably got to direct this film because the stars’ dates were blocked and Rohit Shetty was unavailable. In any case, it is a Phagwara remake of SS Rajamouli’s Telugu film Maryada Ramanna, which, to give the plagiarist credit, stole from 1923 Buster Keaton film, Our Hospitality. 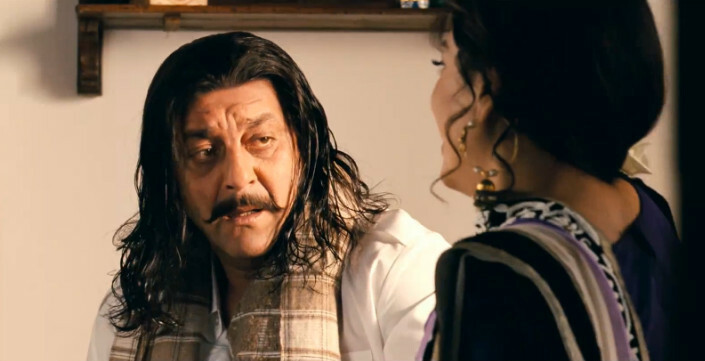 The Sandhu clan, led by Billu Paaji (Sanjay Dutt) has vowed to kill the last Randhawa, but when Jassi (Ajay Devgn), the man they haven’t been able to trace for 25 years, lands up at their home as a guest, rules of Indian hospitality prevent them from killing him as long as he is inside the threshold. The 25-year wait has kept Billu a bachelor, since he swore he would marry only after Jassi was dead, which means his chirpy moonh-boli-biwi Pammi (Juhi Chawla) hovers around as additional comic relief. Jassi is a peacable sort, who only wants to sell his land and return to London, but when he discovers the murder plot, he does everything he can to stop from getting out of the haveli, guarded by Billu’s moronic cohorts. It helps that he had fallen for Sukhwinder Sandhu (Sonakshi Sinha) on the train to the village. It’s a one-gag film that stretches on interminably, punctuated with excessively colourful song-and-dance sequences, exaggerated chases and fights of, the typical South film variety that have become popular in Bollywood, and a lot of Oye This Oye That shouted at lung-busting volume.